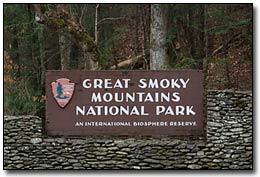 Located on the Tennessee/North Carolina border, Great Smoky Mountains National Park is the most visited park in the United States, with an average of 10 million visitors per year. An International Biosphere Reserve, the Park has about 12,000 identified species of plants and animals. While summer and fall see the highest number of human visitors, winter sees the lightest tourist impact. Weather during early December will typically range from 20-40 degree lows at night and 40-70 degree highs during the day. The most heavily photographed subject during this time in the Smoky Mountains is the Whitetail Deer. Early to mid-December is when the whitetail deer has attained peak physical conditions. 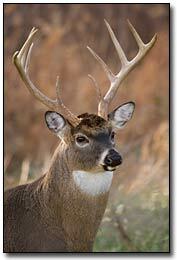 Bucks have swollen necks and darkened antlers while doe's are plump and sleek due to summer's feeding. 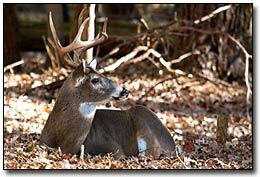 This is also a very active time for the whitetail deer as the breeding season is typically in full swing. Bucks are very active and chasing does at all times of the day, giving a high likelihood of not only locating a trophy animal, but successfully photographing it as well. Photography later in the season can also be successful as bucks are looking to regain the energy and fat stores they had depleted during the breeding season. Cades Cove has the most dense population of whitetail deer within the Smokies. Cades Cove consists of an 11-mile loop road with two cross-roads (Sparks Ln. and Hyatt Ln.) to make the trip shorter if needed. A primary goal while photographing whitetails within Cades Cove should be to capture them in the most natural habitat possible. Cades Cove abounds with overgrown fields, broomsage, open forests, creek bottoms and ridge lines which create ideal habitat to create professional looking images. The best areas are on Hyatt Lane and from Hyatt Lane to the west end of the loop. Also within the Cove are mowed hayfields and horse pastures. However, these areas typically do not provide a proper natural habitat needed while photographing whitetails. Telephoto work doesn't have to be the only images to concentrate on. Look at the big picture, with fields and animals in the foreground and the majesty of the Appalachian Mountains in the background. Frost is common and can add a distinctive element to your photos during a morning shoot. Adverse weather conditions such as rain, fog and even snow can add drama, so don't stop shooting simply because the weather may be poor. Deer are most active during the morning and evening hours. Luckily for photographers these periods also produce ideal lighting conditions. During these times of day you may wish to concentrate on open, natural looking fields in full morning/evening sunlight. These lighting conditions will produce a very warm and appealing image. During late morning and early afternoon during the harshest sunlight you may wish to concentrate on open timber areas. Lighting in these areas produce an acceptable shutter speeds for wildlife photography, don't harbor the harsh sunlight of open fields, and still provides natural background conditions necessary for successful photography of the whitetail. Slowly walk through these areas in search of bedded deer. Don't forget to look up occasionally as you may spot something of interest such as roosting owls, other birds and possibly a bear. Popular wildlife photography lenses include Canon's 100-400mm f/4.5-5.6L IS, Nikon's 80-400 f/4.5-5.6 ED VR and a host of other telephoto lenses such as 400 f/2.8's and 500 f/4's. I highly suggest use of a tripod, or at minimum a monopod. Use the lowest f-stop possible to ensure a shallow depth of field, allowing your subject to stand out against background. Paying close attention to shutter speeds will ensure sharp photos. Adjust your film speed or digital ISO as needed. Proper shutter speed is highly dependant on tripod and head equipment, lenses, focal lengths and individuals. I'd suggest a minimum of 1/125th on a tripod to ensure a sharp image. Be sure you have enough memory or storage capacity for your digital camera, or enough film. It's not uncommon to shoot 8-10 rolls or more of film on a good day.